user id 88634 asked if laying down the rules is a good thing, considering dkos started out so libertarian, with what ever people wanted to do was ok.
kos passed on answering, mcjoan says they've got more important things to do to moderate and handle the little fights. chris is amazed at commentors ability to not "not feed the trolls." just move on. mibride asks, what's in your crystal ball, markos? be specific. markos: i have no clue. we're going to try to filter the diaries, to filter out the diaries that aren't so good. but he's looking forward to the next big spurt in growth, ie, 2008, so he's beefing up the technology infrastructure for traffic, and how can we monitor when passions are running high? this is actually more exciting to him than the punditry. keeping the site healthy and growing really gets his creative juices flowing. demondeke: he wrote his last diary about getting out and connecting with the grass roots, and then went out and actually worked on the ground. what can be done to move the content of blogs more in that direction? chris: wish i knew, blogs are a great communication tool, but maybe not the greatest activism tool. he's not sure if activism in 2006 is any greater than in 2003 or 4, when blogtopia (y!ictp!) was 1/10th the size. the best thing is to keep talking until people stop talking and start doing. hunter: alot of the netroots are people who have never done this sort of thing before, so maybe it's just a matter of time before people get comfortable with going out and knocking on doors. there are so many people here (blogtopia, yictp) who never thought they would be involved in politics, so it takes time for people to get adjusted and believe they really can make a difference. tim smith, aka timrod, wants to talk about anonymity. a question popped up how could you attack jeff gannon for another id, when today we're missing armando who is involved in the anonymity problem. hunter: of all the issues with jeff gannon, his using a different name was not the problem (big laughs and applause). hunter uses a pseudonym because some bloggers get harrassment at work with their clients. hunter is an internet consultant. he says some day he may come out, but he's really no one special. a good side to pseudonym does is it forces you to concentrate onthe writing. it makes you think who is this person and why should i listen to him? with a pseudonym each individual piece stands on its own. kos: it's not anonymous, we know who this person is, we just don't know his real name. we all remember when people thought atrios was sidney blumenthal, and he came out and said "i'm duncan black" and we're all like "who?" and "why do we care?" and when i became markos moulitsas it was anti-climatic. he urged people if you blog do not blog under your real name because people will screw you. the only people who should blog with your real name are people who don't fear losing your job because of your blogging opinions. 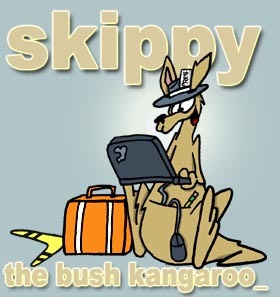 skippy's personal note: i use my real name. hunter: i find it remarkable that people are willing to be at other people's throat just for the thrill of having a contrary opinion. and i pin that on how politics works right now, the white house itself, the politics of constant division. nowadays if you have a contrary opinion people will try to damage you (big paraphrase here, i was busy blogwhoring this post on dkos). now it's if we disagree with you we're not going to hate you we're going to hurt you. q (from james of the american liberty project): how can anybody read all this stuff?? will you create weekly kos? put the best out on a weekly basis for those of us who can only spend 12 hours a day reading this. kos: there's two answers, one is i don't want to over-extend myself and weaken the core product, so i would not do a weekly kos. two, we're working to make a search function for the highest rated of the last week. pyrrho asks, do blogs serve as models for the kinds of communities that we want to build in the real world? chris says that would be a dark and disturbing world. i mean, they serve an excellent function of bringing people from great distances together. david boyle: what's happening with armando, did conservative bloggers act appropriately? dailykos without armando is like a volcano without lava. kos: you say that like it's a bad thing. kos: armando's going to make his own decision. the site is strong enough that anyone can leave. i left for nine weeks. and it's constantly evolving, there's newbies, and oldtimers say "these newbies are stinking up the place, not like when i came here, it was so much better," then they fade away, and the newbies become the oldies, and they say "ooh, these newbies are stinking up the place, it was much better when i came," and the first time that hapened i actually cared. q: kos in espanol, kos for segmented communities, is it worth it? kos: i'm not going to do it, no. mcjoan: i don't know who would do it, i love the idea but we've got our hands full. susan g: what about street prophits? kos: pastor dan has a huge following, it was clear there was a huge demand for a spin off site, so i built that. there is also mother talkers for mothers, but i can't over extend myself more than i already have. it was like we were sitting around and someone said, hey markos, why don't you do a conference, and i said, why don't you do a conference? and somebody did, gina did a great job! major danby: he thinks dkos is great for being user friendly, maybe not for the faint of heart. but what can we do to make it more observer friendly? what ideas do you have to make sure the gems are in some way more available to people like media matters does or snopes.com. hunter: the dkosapedia is a good start to making archives. the guy who made thank you stephen colbert.com: how can we make dkos into more of a think tank? where can we see the papers and media talking points that we can re-distribute as effectively as the right is doing? chris: the difficulty is more than 250,000 words generated every day, so there's a lot of disagreement about which is best. i would still go back to the tag system and use that to decide which ones are the best for you. i don't think it's up to markos to set that down, its' something for each user to decide for him or herself. kos: the key would be to actually build those think tanks and tap into that talent. think tanks exist for a reason, that's what they do. blogs are different and it's not easy to stick that square peg into a round hole. d-day: can't believe there's people watching on c-span with their heads probably exploding, they don't know what they're talkking about. there's a lot of lurkers here, probably 30 to 40%, the question is, is there a way to get lurkers more involved. cskendrick: is it safe to have an opinion, to have a paper trail on your opinion. if there's one thing we do well it's help each other. the best diaries are the ones that help. mary scott o'connor: when are you going to expand the recommended diary list? it's not me that's getting shoved off, i've got my own site. i saw four posts on the recommended diary list by public people, and three of them were emails i got in my email. kos: the recent diary list will become an intermediate diary list, the recommended diary site will move slower. chris: the new tagging system helps also.